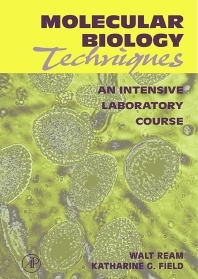 This manual is designed as an intensive introduction to the various tools of molecular biology. It introduces all the basic methods of molecular biology including cloning, PCR, Southern (DNA) blotting, Northern (RNA) blotting, Western blotting, DNA sequencing, oligo-directed mutagenesis, and protein expression. Beginning graduate students in molecular biology, biochemistry, genetics, microbiology, and cell biology. Also researchers and technicians in molecular biology, biotechnology, cell biology, microbiology, and biochemistry. Course Synopsis: Introduction. Safety Precautions. Daily Schedule. Acknowledgements. Exercises: I. DNA Preparation, Polymerase Chain Reaction, and Molecular Cloning: Cesium chloride-ethidium bromide density gradient centrifugation. PCR to synthesize virD2 flanked with restriction sites. Restriction digests of plasmid pGEX2 and PCR products. Purification of DNA fragments from agarose. Ligation of PCR product to pGEX2 vector. Transformation of E. coli with the ligated plasmid. Small-scale preparation of plasmid DNA by the alkaline lysis method. Restriction analysis. Study questions. Protein Expression, Purification, and Analysis: Expression and purification of a fusion protein. SDS-polyacrylamide gel electrophoresis. Silver stain detection of proteins. Study questions. Oligonucleotide-Directed Mutagenesis: Restriction digests of virD2 (in pCS64) and pUC119. Purification of DNA fragments from agarose. Ligatation of restriction fragment and vector. Transformation of E. coli with the ligated plasmid and recovery clones. Small-scale preparation of plasmid DNA from broth cultures. Restriction digest of DNA: examination to confirm insert. Preparation of single-stranded DNA template. Phosphorylation of oligonucleotide. Annealing mutant oligonuleotide to template. In vitro DNA synthesis by primer extension. Transform synthesis reaction into E. coli DH5a. Small-scale preparation of plasmid DNA. Confirmation of mutants by restriction analysis. Study questions. DNA Sequencing: Polyacrylamide sequencing gel electrophoresis. Didexy sequencing. Automated Sequencing. Introduction to databases and gene sequence analysis. Study questions. Southern Blot Detection of DNA: Preparation of genomic DNA from Agrobacterium tumefaciens. Restriction digestion of genomic DNA. Agarose gel electrophoresis of restriction fragments. Southern blot: denaturation and blotting of DNA gel. Preparation of probe nick translation. Hybridization and washing of Southern blots. Study questions. Northern Blot Detection of mRNA: Preparation of RNA from tobacco leaves. Agarose-formaldehyde gel electrophoresis. Northern blot: denaturation and blotting of RNA. Probe preparation. Hybridization and washing of Northern blots. Study questions. Protein Interaction Analysis in Yeast: Yeast transformation. Filter b-galactosidase assay. Index. Walt Ream, Professor of Microbiology, Oregon State University, received the Richard M. Bressler Senior Faculty Teaching Award for developing the course this book supports. In addition to this work, he has written numerous peer reviewed scholarly papers, review articles, book articles and chapters and has co-authored another book entitled, Molecular Biology Techniques: An Intensive Laboratory Course. His research led to a discovery for which a patent was issued in 2004. He regularly reviews grant proposals for NSF, USDA, DOE, NIH, American Cancer Society, NSERC-Canada, Lindbergh Foundation, Corporation for Plant Biotechnology Research and he reviews papers for Journal of Bacteriology, Plant Molecular Biology, PNAS, Science, Molecular & General Genetics, Microbiological Reviews, Molecular Plant-Microbe Interactions, Biochemistry, Journal of Biological Chemistry, Plasmid, Gene, Plant Physiology, Journal of American Horticulture Society, and Molecular Microbiology. He is a member of Genetics Society of America, American Society for Microbiology, and American Association for the Advancement of Science.